In cult-TV history, child-birth almost universally happens at a bad time. The main characters are undergoing a crisis, catastrophe approaches, and then -- and only then -- a main character goes into labor. This trope is useful because it allows for the juxtaposition of death and new life, of course. 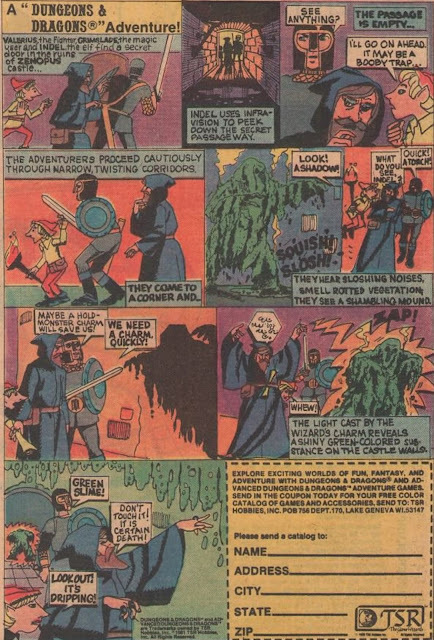 But on the other hand, many of these stories are space age variations of "baby born in a trapped elevator!" stories. The rule seems to be that if there is a bad time to deliver a baby, then a TV show will find it. Let's review some prominent, badly-timed child-deliveries in cult-TV history. How about going into labor while you're on the run from your own people, who are trying to kill you? You will go into labor in a mountain cave, as three strangers defend you and your people from a warrior race bent on your destruction? 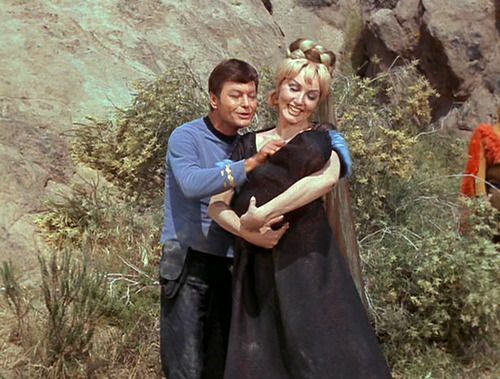 That's what happens to Elaan (Julie Newmar) in the Star Trek (1966-1969) episode "Friday's Child." How about giving birth to the first baby ever to be carried to term and delivered away from Earth? 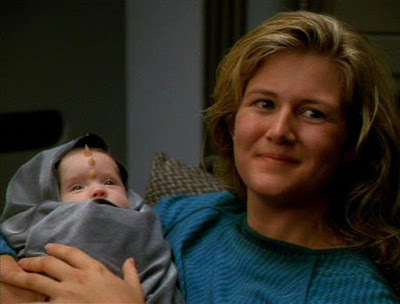 And to add to the uncertainty, there are some unseen, malevolent aliens nearby who wish to possess humanoid forms, including the form of your newborn? 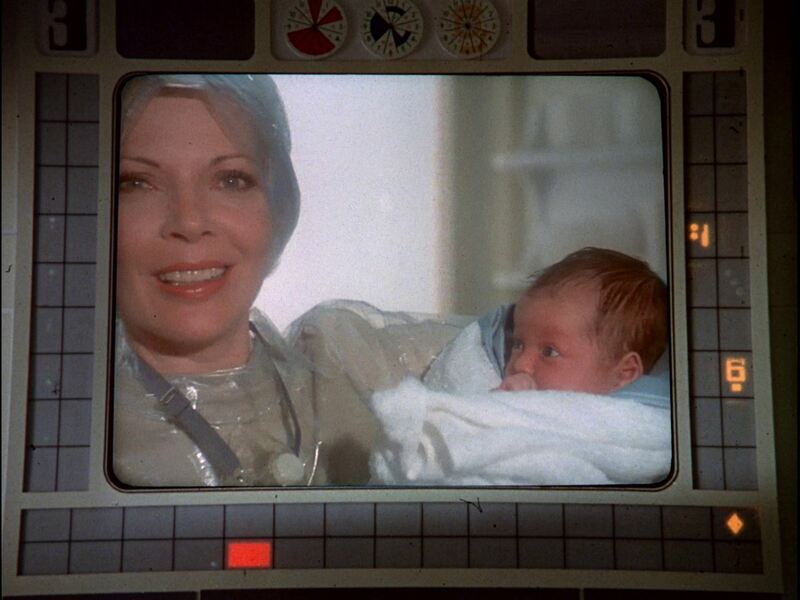 That's the story of Jackie Crawford's birth in Space: 1999's (1975-1977) "Alpha Child." Or how about giving birth right as your homey, state-of-the-art galaxy class starship unexpectedly strikes a quantum filament? 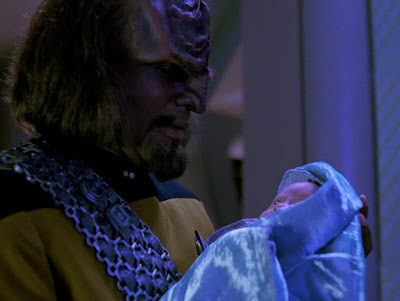 That's what occurs with Keiko O'Brien (Rosalind Chao) during her child's birth, in the fifth season Star Trek: The Next Generation (1987-1994) episode, "Disaster." Of course, Keiko could have had it much worse. Her baby could have died during child-birth when her ship encountered a "spatial scission." That is the catastrophe that befell Ensign Samantha Wildman in Star Trek Voyager's (1995-2001) "Deadlock." Other cult-TV programs have dealt with child-birth in a completely different way, building-up a sense of mystery about the nature of the child. That mystery builds and builds...until delivery. 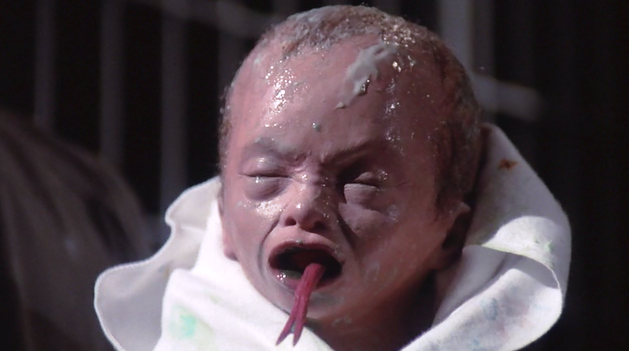 Consider V: The Final Battle (1984), when Robin gives birth to twins. One baby appears human (initially), and the other appears....reptilian/Visitor. 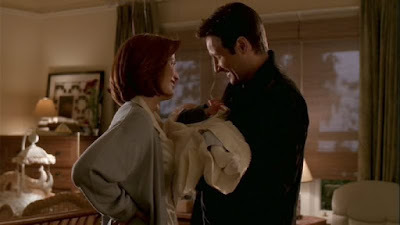 Another example is Scully's child-birth experience in The X-Files (1993-2002) episode "Existence." There, Scully and the audience did not know until delivery if the child would be human, alien, or some unholy combination of both.